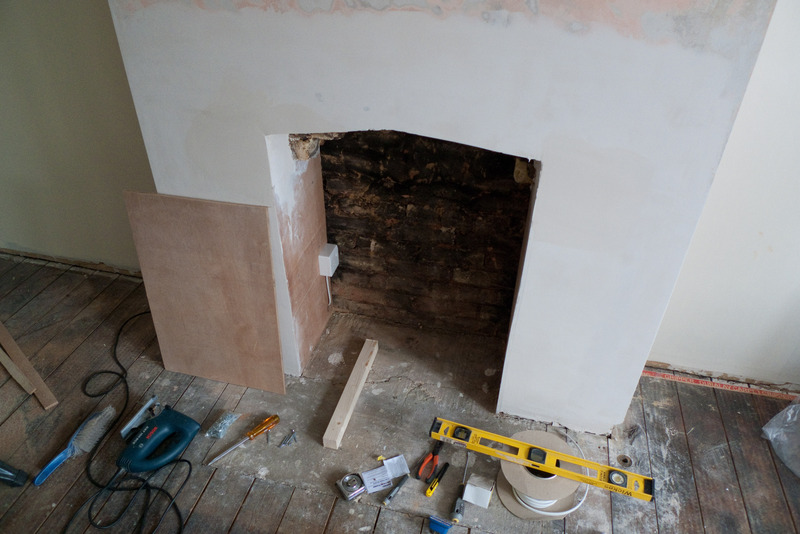 The birth of this project was a visit to a DIY superstore as part of gutting and decorating the Lounge/Living Room. The choice of wall colours was easy, Oak floor agreed on and a new Leather Sofa and chairs a given. The choice of fireplace was more problematic. 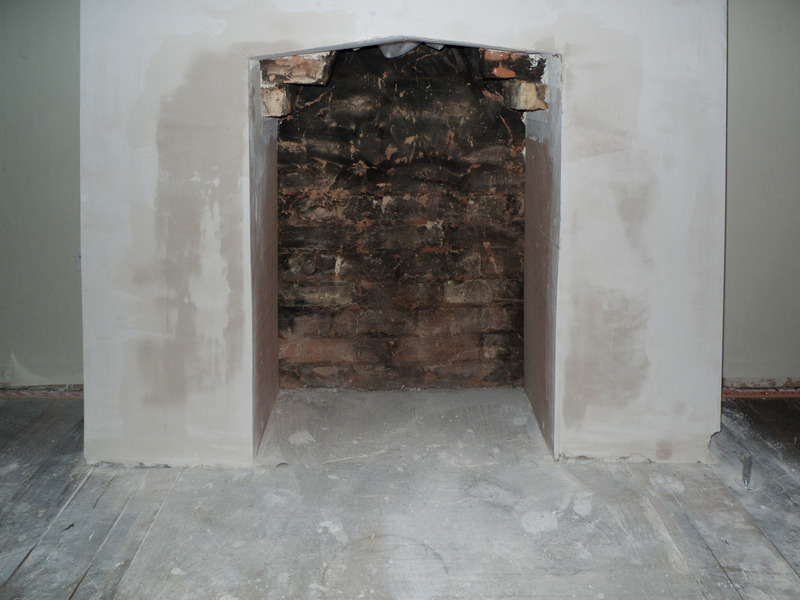 The existing fireplace was old, but not in a good antique way. 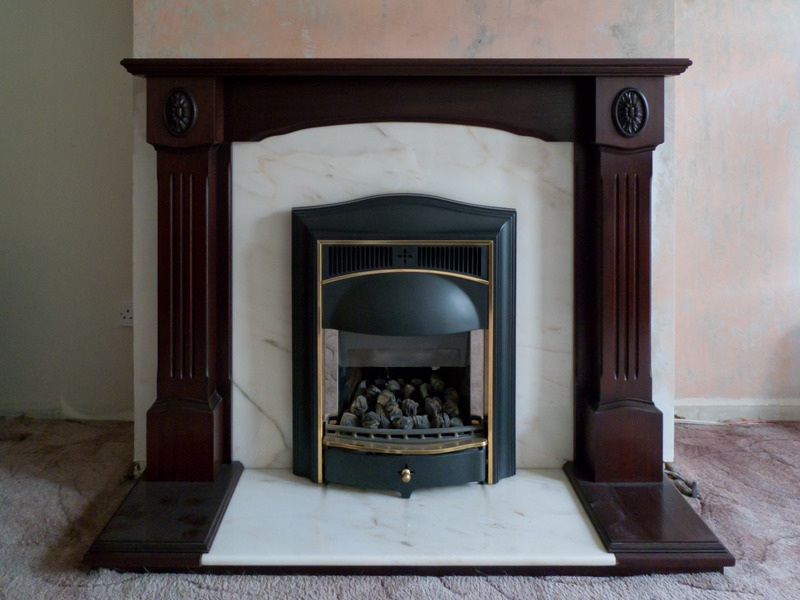 Modern hang on the wall electric fires can look tacky with their fake flame effects, and the more expensive electric and gas wall mounted fires can get very costly. Most of those I saw with relatively easy fitting hung on the wall, protruding anywhere from four to six inches. They look fine from the front, but not so good from the side. What I really wanted was a fire flush with the wall, but that’s the point the cost starts rocketing. While in the DIY store myself and Mrs Basshead saw an LCD wall hung fire. A 19 inch screen played video’s of various fire’s, and there were also a few other scenes available. 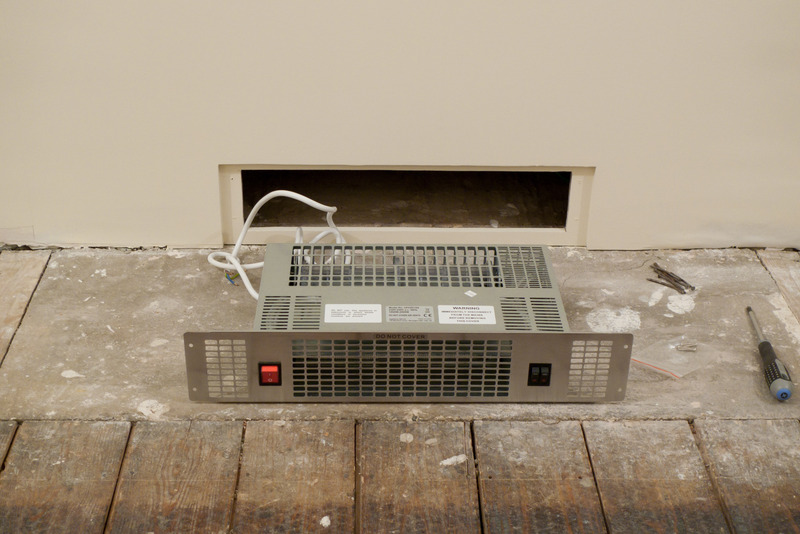 A remote control selected the video’s and also operated the 2kw heaters . A nice idea, but still wall hung not flush. The available video’s were also not great quality and the screen was not very high resolution. This had started me thinking of a bespoke alternative, and since I build a hackintosh every few months why not stick one in the wall behind an LCD monitor? 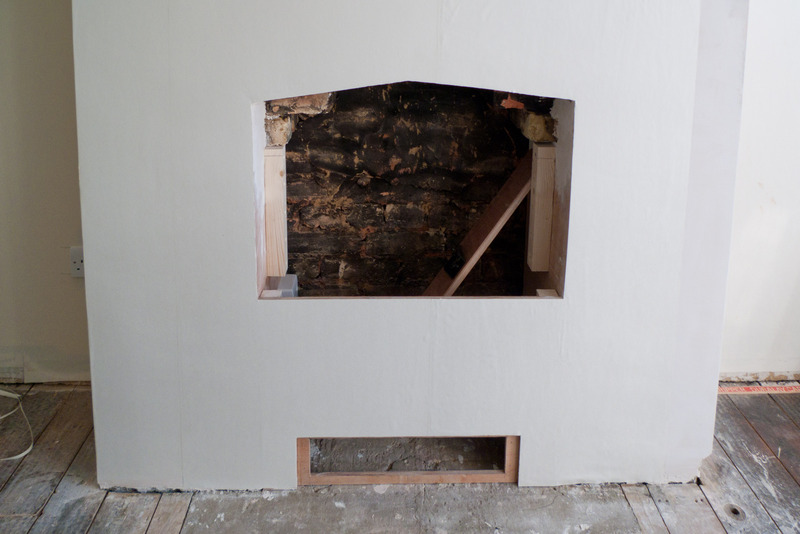 A custom built surround would make it look the same as a wall hung fire with the advantage of being easily replaceable in the future. I already use a Keysonic wireless keyboard/trackpad with the HTPC in the same room so a smaller version would work great. The network cable for the HTPC already ran past the fireplace so putting a gigabit ethernet switch behind the fire would mean no extra network cable runs into the room, and retain the fastest possible connection for the HTPC. I ran my ideas past Mrs Basshead, who was happy for me to get my geek on with the provision that (1) it looks like a fireplace, not a computer stuck in the wall, and (2) it costs much less than the £699 LCD fire we saw in the DIY store. The total for the hardware was around £300, including the Acer LCD. This was the cheapest one I could find that got reasonable reviews. While not offering the best image quality available it’s massively better than the display on the LCD fire I had first seen. Building the hackintosh was the same as the HTPC, only this time I used the MyHack installer to simplify the process. There’s a comprehensive guide on the site that explains the steps involved so I’m not repeating them here. The only problem I had with the install was the Ethernet built into the motherboard, as I hadn’t realised the board ordered was a version 2, while my HTPC motherboard had been a version 1. The Ethernet chip had changed, and the version 2 chip was not compatible with Snow Leopard. Easily solved with a cheap ethernet card I had in the spares cupboard, but worth remembering if you intend to use this board. Once built the system was tested for 1080p MKV file playback using a range of media player applications. MKV was chosen as I recently bought a BDrom drive to go in my main hackintosh, enabling Blu-Ray discs of Fireplace and Fishtanks to be ripped to a file. The video can be kept at original bitrate/quality/size or re-encoded to something less space consuming. VLC, Movist, Nice Player and Quicktime were tested, and the final choice was VLC. Movist offered smoother playback in its default settings, but VLC has a huge range of options for playback. Some tweaks to VLC quickly got it’s 1080p looking smooth, looping and fullscreen by default. The other media players I tried didn’t offer the playback features I was looking for. The controller for the system caused some searching and testing. Part of the requirements on top of offering enough keys to select which video to play was the ability to wake the computer from sleep with a key press. 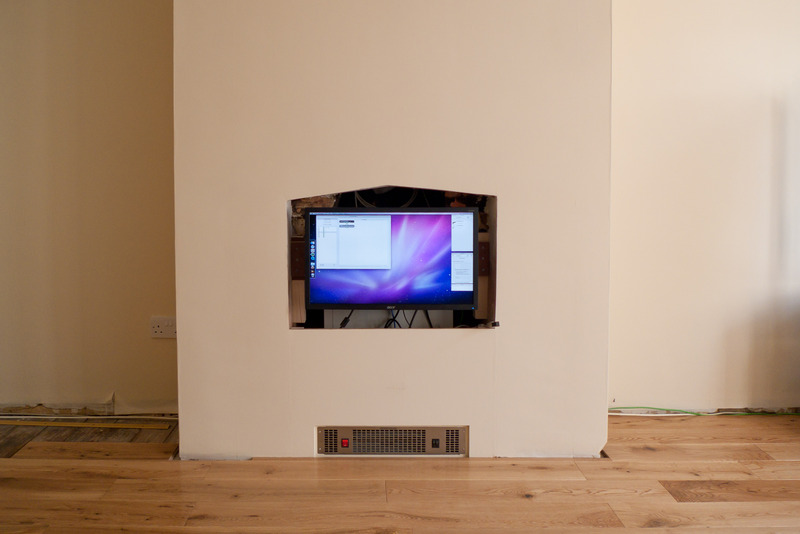 The Keysonic keyboard/trackpad used with the HTPC can do this but I wanted something smaller for the Fireplace. The initial plan was to use a wireless keypad of the type sold as an add-on for laptops. The first one tried was a Targus Wireless Keypad and Mouse Combo which works perfectly under Windows but not with Mac OS 10.6. Next a Targus Wireless Numeric Keypad AKP11EU. This worked perfectly with a range of around three feet. Fine for a laptop needing a numeric keypad, lousy for controlling a computer from up to ten feet. After failing to find a good looking wireless numeric keyboard with good range I switched my attention to smaller wireless keyboards. Keysonic make some excellent quality keyboards so the next try was an ACK-340 RF+ mini wireless keyboard/trackpad. This has excellent range, wakes the computer from sleep and offers enough keys and a mini trackpad to use the computer for any tasks required. Once the keyboard input was resolved the next job was linking the keypress to launching VLC with the required video. The best candidate was Controllermate, an amazingly flexible application for customising the behaviour of HID devices. That includes keyboards, keypads, mice, trackballs and joysticks, all of which can be linked to a huge range of actions. My usage is very simple, just linking Function key presses to launching video files. Once the hardware and software were tested the final step (and the biggest) was installing the hardware into the fireplace. 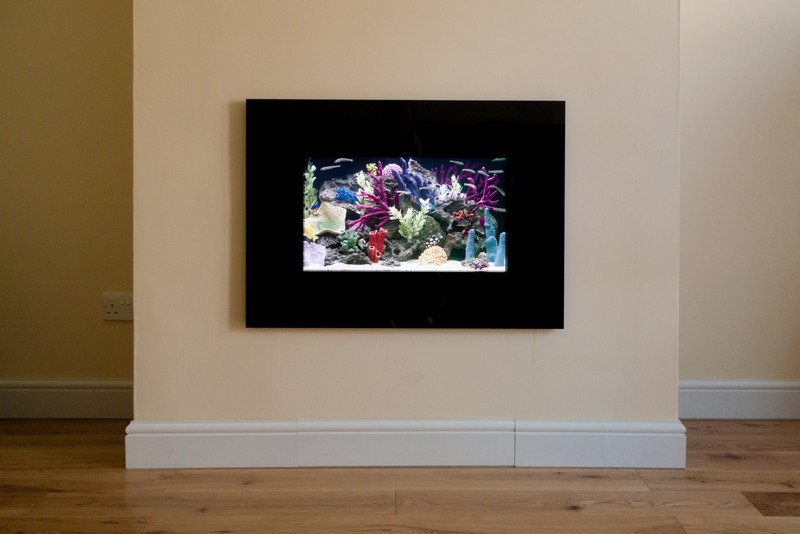 The photo’s below show the steps involved for this, culminating with the fitting of the monitor surround. This was made from 10mm black opaque acrylic, chosen for weight and cost. Glass was another option, but at £175 against the acrylic’s £70 cost it was the less viable option. Very nicely done, I love to see creative hacks such as this one and it makes me proud that you used myHack to set it up quickly and easily.